"Speaking with kindness creates confidence, thinking with kindness creates profoundness, giving with kindness creates love." 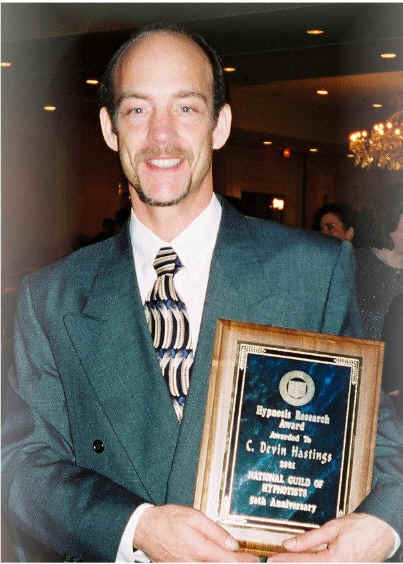 Christopher Devin Hastings has over 20 years experience practicing hypnosis in its applications to help others. He holds advanced certification with three of the most prestigious hypnotherapy schools in the United States. Devin also holds a degree in electronics and was certified in satellite ground equipment technology by the U.S. Army. 2003 recipient of the Ormond McGill Award. Fellow of The Association for Professional Hypnosis and Psychotherapy. 2001 recipient of the prestigious Hypnosis Research Award. This award was given in recognition of Devin's pioneering work in the successful applications of hypnosis to diabetes. Hospital Certified Hypnotherapist. Certification granted by one of America's top 100 hospitals, Winchester Hospital, Winchester, Massachusetts. Registered and Certified Master Practitioner & Instructor of Neuro-linguistic Programming with the National Federation of Neurolinguistic Programmers. Featured presenter on the proven medical applications of hypnosis at the National Guild of Hypnotists convention. This is the world's largest and most comprehensive hypnosis convention. Certified Instructor of Hypnotherapy by the Hypnosis Research & Training Center, Minneapolis, Minnesota. Registered and Certified Advanced Hypnotist with the National Guild of Hypnotists. Registered and Certified Fitness Instructor with the Fitness Institute International of Boca Raton, Florida. Devin combined his Instructor training with his training as a licensed massage therapist and his extensive knowledge of vitamin supplement therapy to help clients dramatically improve their health. Author of the popular training seminar, Emergency Hypnosis: How To Successfully P.A.N.I.C. TM In Any Emergency Situation. Author of the advanced NLP-Hypnosis training video, Past Lives and Safe Places: A Journey To Forbidden Lands. Author of the unique and ground breaking training video, The 10 Steps to Controlling Diabetes. Author of a first-of-its kind training program, New Answers for Diabetes: Become A Certified Diabetes Motivational Coach. This is a very intense and comprehensive two day seminar which trains therapists on the advanced applications of hypnosis, NLP, Transactional Analysis and Cognitive Behavioral Therapy and their applications to help diabetics very effectively manage their diabetes. In some cases, Devin's coaching methods have helped clients to significantly reduce their medications. (with their doctor's approval). Author of 10 Success Secrets To Permanent Weight Loss. This is an informative and fun to watch video seminar demonstrating little known marketing techniques as well as advanced methods for helping clients to permanently lose weight. Author of The Information Kit for Obsessive-Compulsive Disorder. This is an audio program guiding other therapists on the applications of NLP and hypnosis to helping those suffering from OCD. Author of Impotence: The Hidden Pain. This program is designed to teach therapists a caring and highly effective approach to a very difficult issue. Author of several excellent marketing audio programs helping other therapists to effectively and inexpensively market themselves while helping others. Co-author with Dr. Kevin Hogan of the textbook The Hypnotherapy Handbook. As a Type II diabetic, Devin has used his skills and experience to pioneer new techniques of management for diabetes. His unique approach was published in Diabetes Interview, a leading diabetes journal. Devin has been featured on WESH TV Channel 2 News Orlando and Host of 'The Hypnosis Hotline' on 740 WINZ AM News radio. Devin has also used hypnosis to successfully lose over 40 pounds of weight and to have 9 fillings drilled and replaced without any chemical anesthetics..
"I have known Mr. Hastings for quite some time. It is my honor to give him my highest recommendation to you as a hypnotherapist. His skills place him in the top 1% in his field. My recommendation comes without reservation. Please feel free to call me with any question you may have." "Christopher Devin Hastings has been practicing hypnosis since 1982 and is certified by one of the most well known schools in the United States. As well as being a certified Fitness Instructor, Mr. Hastings has had extensive training in the application of vitamin supplement therapy. As a licensed Massage Therapist he has very successfully combined hypnosis with massage therapy to produce powerful healing results. Besides being a certified member of the National Guild of Hypnotists, which is the world's largest and oldest organization of its kind, Mr. Hastings is a certified instructor of Neuro-Linguistic Programming. NLP is a revolutionary psychological approach to making lasting behavioral changes in an extremely rapid manner." "Devin Hastings is one of the most capable hypnotherapists I have known. He is competent and very effective. His approach is unique and powerful." "Hypnosis has changed my life. My friends and family have noticed a big change in me. I have never felt better!" "My daughter had a real fear of thunder and lightening storms. After one session she was sitting out on the porch during a thunder storm waiting for her friends!" "I stuttered so bad I couldn't talk to girls in my high school. After Mr. Hastings helped me I was able to date a girl I had wanted to talk to for a long time"
"Mr. Hastings had to come to my house for the first 2 sessions because I couldn't walk due to the pain. The third session I made it up to his 3rd floor office!" "I stopped smoking after the 1st session!" "Devin Hastings is a brilliant public speaker and a talented man whose insights into the human heart and mind are enviable. Devin is outstanding at sharing ideas, making them understandable and easy to learn. I give him my highest recommendation to any school or facility that can bring Devin in to teach or train for them." At a new product introduction event, we gained a client because Devin hypnotized him to stop smoking and it worked! His wife was so happy that he quit that she suggested he do business with us to make sure that 'the spell' continued to work. David DuPape, President, Health Logix Ltd.
"Devin Hastings is one of the most capable NLP practitioners and instructors I have known. He is competent and very effective. His approach is unique and powerful." "I am impressed with Devin both professionally and personally. He is an outstanding presenter." Chaplain Paul G. Durbin, Ph.D. Director of Clinical Hypnotherapy, Pendleton Memorial Methodist Hospital, New Orleans, La. "From over 200 presenters each year at the NGH convention, Devin Hastings has consistently ranked among the top in his ability to present information in a truly interesting and lively manner." I received numerous positive comments from the telecommunicators about the class. Comments such as ‘the best training they have ever had’ and ‘it not only helped me professionally, but personally’ are a a true indication of the the high quality of materials and discussion you presented. They are already asking when you can return." Thank you for your recent presentation to the Better Business Bureau staff. You not only helped us gain the insight needed to make positive change happen, you gave us the tools and courage to try. I know each one of us came away with techniques to enrich and enhance our professional and personal lives." Judy Pepper, President, BBB of Central Florida, Inc.
"Devin is one of the best speakers we have ever presented at TLC. He is powerfully inspiring, sincere, helpful, and kind. All of the employees rave about him and the information that he delivers. We at AT&T’s TLC feel that you will most pleased with the wonderful seminars filled with the vast knowledge of Devin." Dear Devin, You were a big hit at our West Orange Relay For Life! Everyone loved your presentation. I wish we had more time for you on stage. We raised $136,000.00+ at West Orange--thank you fore your support. I hope you will consider coming again next year. IMPORTANT NOTE: If you are interested Devin will donate his time to help you raise money for your charity. He can either give an informative seminar or an entertaining, family oriented hypnosis stage show. To contact him, please email: devin@mindbodyhypnosis.com* or call 612-730-2789. *Please copy and paste the email address into your mail service. It has been disabled from automatically opening because Spam Spiders crawl website finding active email addresses to send horrific amounts of garbage to. Thank you for your understanding.